Event Quest Sandlot Inspect the Absent Silhouette. See here. Mail Delivery Market Street: Station Heights Complete within 14 seconds. Very, very easy to complete in the time limit. Just make sure that you start to grind at the top of the ramp, to allow enough buildup to reach the second bird. Don't manually jump, or you might overshoot. After delivering, do a sharp right to reach the last person. Cargo Climb Market Street: Station Heights Complete within 15 seconds. For an easier time, equip Fenrir for Negative Combo, as well as the ability that Sora learns at a certain level, depending at what weapon you picked at the beginning of the game. Also unequip other abilities that'll interfere, such as Combo Plus. Once it starts, lock onto the cargo, and perform a triple combo. This should cause the cart to be thrown into the air. Quickly hit it whilst in the air to push it a great distance. Immediately perform another triple combo once it lands again. Grandstander Market Street: Station Heights Complete with 100 points or more. Equip the Berserk Charge ability (the Fatal Crest Keyblade also has this ability attached to it), use up your MP with Curaga, and hit the ball into the air for a long aerial combo that should get you enough hits. Poster Duty Market Street: Tram Common Complete within 30 seconds. Make sure to have Glide Lv3 and Aerial Dodge before attempting this. Aim for the sets of three posters as you stop briefly to place singles. 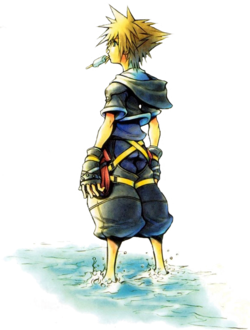 Keep in mind that Sora does not have to touch the ground to place posters. Bumble-Buster Market Street: Tram Common Complete within 10 seconds. Cast Magnega to defeat all bees instantly. Junk Sweep Market Street: Tram Common Complete with less than 6 points. Sora gets a point for every hit. To keep your hits to a minimum, equip Fenrir and Negative Combo, and unequip any Combo Plus abilities. Push the junk by walking into them, so that they eventually end up in a straight line. Hit the junk at the head of the line and it will fly into all of the others, destroying them in one hit. The Struggle: Hayner Sandlot Win by a margin of 100 or more points. At this point, Hayner is incredibly weak and very easy to combo. This mission should be cleared easily. The Struggle: Setzer Sandlot Win with 150 or more points. Defeat Hayner ten times to unlock the match with Setzer. To defeat Hayner more quickly, collect all of his orbs and the match will end automatically. Like Hayner, Setzer is a very easy opponent that should give you no trouble. The Struggle: Seifer Sandlot Win with 200 points. Defeat Setzer 10 times to unlock the match with Seifer. As with the others, Seifer should be defeated easily. SB: Street Rave Market Street: Station Heights Finish with 1,000 or more points. Speak to a girl at the bottom of Station Heights to start. Begin by grinding and hold while doing so. After jumping off, press again to do a mid-air move. Repeat the pattern to earn enough points. Mushroom XIII: No. 7 Tunnelway Complete within 10 seconds. See here. Mushroom XIII: No. 8 The Tower Complete with a score of 85 or more. See here. Mushroom XIII: No. 12 The Old Mansion Complete with a score of 40 or more. See here. Event Quest Postern Meet the three girls again. See here. Dark Depths Meet Sephiroth again. See here. SB: Freestyle Marketplace Finish with 200 or more points. Speak to Scrooge to begin. Grind and do jump tricks to earn 200 points in time. Cavern of Remembrance Postern Enter the Cavern of Remembrance. Enter the hole in the wall after meeting Sephiroth. Cavern of Remembrance Investigate the depths of the Cavern. See here. Garden of Assemblage Fight Xemnas again. See here. Mushroom XIII: No. 9 Castle Gate Complete with a score of 75 or more. See here. Mushroom XIII: No. 13 The Great Maw Challenge to a duel. See here. Event Quest Beast's Room Inspect the Absent Silhouette. See here. Mushroom XIII: No. 3 Bridge Complete with a score of 450 or more. See here. Event Quest Cave of the Dead: Inner Chamber Inspect the Absent Silhouette. See here. Phil's Training Olympus Coliseum Complete with a score of 1,000 or more (Maniac). Speak to Phil for training. After clearing the Practice round, Maniac will be unlocked. To maximize your score, hit the big pots into a group of smaller ones, as it will earn you many more points than destroying it on its own. The Underdrome: Pain and Panic Underworld Entrance Win with a score of 2,000 or more. Speak to Pain to enter any of the Underdrome tournaments, and Hades in his chamber to enter the Paradox tournaments. For all of these score goals, the easiest way to do this is with summons. Get your health into critical state, then summon Stitch and do nothing. He stuns the enemies and, because these enemies do not drop HP, they'll drop more than enough points. Right before he leaves, use the Ohana limit to drop even more points. If you ever find yourself struggling but don't want to heal to summon Stitch again (this is especially essential in the cups where Sora can only get hit a certain amount of times), summon Peter Pan. While not nearly as effective, he'll still have the enemies drop a good amount of points. Keep in mind that to unlock all Paradox Cups, you must max your summon level. The Underdrome: Cerberus Win with a score of 1,000 or more. The Underdrome: Titan Win with a score of 5,000 or more. The Underdrome: Goddess of Fate Win with a score of 3,000 or more. The Paradox Battles: Pain and Panic Hades' Chamber Win with a score of 2,500 or more. The Paradox Battles: Cerberus Win with a score of 1,300 or more. The Paradox Battles: Titan Win with a score of 10,000 or more. The Paradox Battles: Hades Win with a score of 15,000 or more. Mushroom XIII: No. 6 Underworld Caverns: Atrium Complete within 45 seconds. See here. Event Quest Cave of Wonders: Chasm of Challenges Redo the Cave of Wonders: Chasm of Challenges. This mission plays exactly the same as the original Chasm of Challenges in your first visit to Agrabah. Peddler's Shop Inspect the Absent Silhouette. See here. Magic Carpet Ruined Chamber Finish with a score of 65 or more. Simply defeat every enemy in your path. To make this easier, you can equip the Fenrir Keyblade and Negative Combo ability, as well as unequipping any Combo Plus abilities. SB: Sand Glider Peddler's Shop Finish with 10 or more points. Speak to the Peddler to begin. Follow the checkpoints across the area. After a practice run, this mission should be easy. Mushroom XIII: No. 5 Cave of Wonders: Treasure Room Complete within 10 seconds. See here. A Blustery Rescue Piglet's House Finish with a score of 18,000 or more. See here. Hunny Slider Rabbit's House Finish with a score of 8,000 or more. Balloon Bounce Kanga's House Finish with a score of 2,000 or more. The Expotition Spooky Cave Finish within 90 seconds. The Hunny Pot Starry Hill Finish with a score of 8,000 or more. A Musical Challenge Undersea Courtyard Perform "Swim This Way" again. You do not actually have to perform these songs again if you have already, as quitting as soon as you begin will count toward the mission. However, if you have not cleared them yet, see here. Perform "Part of Your World" again. Perform "Under the Sea" again. Perform "A New Day is Dawning" again. Gift Wrapping Shipping and Receiving Finish with a score of 150 or more. Focus on hitting the bigger boxes when they come up, as they'll give you a higher score. Also make sure to shoot Lock, Shock, and Barrel every now and again to incapacitate them. SB: Workshop Rave Yuletide Hill Finish with 1,000 or more points. If you want to go for the Pro Skater trophy, this is the best place to attempt it, as there is a bug that allows you to easily achieve 5,000 points that hasn't been patched. Start by grinding off the ramp, performing a trick as you do so, and jumping onto the center platform. Grind off of this, again while performing a trick, and jump into the wall (directly over the center panel which Oogie Boogie would escape through). Sora should be stuck on this panel as long as you keep performing tricks ( should work well) and don't slip off. Mushroom XIII: No. 2 Christmas Tree Plaza Complete with a score of 80 or more. See here. Event Quest Isla de Muerta: Rock Face Inspect the Absent Silhouette. See here. SB: Time Attack Rampart Finish within 40 seconds. Skateboard around the area, following the markers as you do so. This should be accomplished fairly easily. Mushroom XIII: No. 10 Isla de Muerta: Midnight Nook Complete within 55 seconds. See here. Light Cycle Pit Cell Finish with 30 or more points. Points are received from defeating Heartless. Make sure to defeat all Heartless (the Charge ability should prove most useful here) before making a turn, as you may lose some to the wall from sharp turns. Mushroom XIII: No. 4 Palace Gate Complete with a score of 85 or more. See here. Event Quest Hall of the Cornerstone Investigate the mysterious entranceway. See here. Mushroom XIII: No. 11 Waterway Complete within 19 seconds. See here. Event Quest N/A Complete all worlds and defeat Xemnas. See the walkthrough. Mushroom XIII: No. 1 Memory's Skyscraper Complete with a score of 70 or more. See here.